The 6050 Ultimate Channel Strip has input and output stages, wrapped around 3 module bays in which any of the 28 modules can be inserted. Easily drag and drop any module to rearrange the signal flow of your channel strip. Artist Presets included from: Mike Dean, Bob Horn, Neal Avron, ROCAsound, John Feldmann, Aaron Harris, and Lovy Longomba. 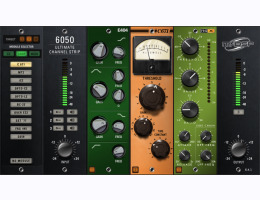 "Download the demo of 6050 Ultimate Channel Strip HD"